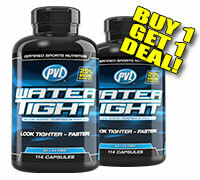 PVL Watertight *BUY 1, GET 1 DEAL!" PVL WaterTight has been one of the most popular diuretics on the market since 2000. WaterTight is scientifically designed to help you quickly shed excess water, reduce bloating and enhance muscle definition. WaterTight's formula is so effective that it delivers noticeable results in as little as 3 days! To look tight and defined you need to shed excess "subcutaneous" water that lies beneath your skin. However, for best physical performance and appearance you need to preserve minerals, electrolytes and the intramuscular water inside your muscle cells. WaterTight is the only product to use all 8 diuretic technologies for purging water while simultaneously nourishing the body with minerals thus preserving electrolytes like potassium. By influencing potassium retention, WaterTight enhances sodium-potassium pump activity to preserve intramuscular water while shedding excess water. This same action works to help eliminate cellulite. The appearance of cellulite is due to water pushing through fibrous tissue under the skin. Eliminating this water will make skin appear smoother and leaner. Watertight effectively enhances physical appearance and well being by reducing puffiness, swelling, bloating and cellulite but without the lethargy and muscle cramping associated with pharmaceutical diuretics. The 12 key medicinal ingredients found in the WaterTight formula were selectively chosen not just for their individual ability to purge water, but also because of their synergistic effects when combined. Because of this synergistic formula WaterTight is so effective that it works in as little as 3 days! WaterTight is so powerful that it's the preferred choice for natural diuretics amongst top pro bodybuilders, fitness models and figure cover models. WaterTight is a professional strength diuretic that is scientifically designed to help you quickly shed excess water, reduce bloating and enhance muscle definition. WaterTight is engineered to help you quickly shed water beneath your skin (subcutaneous water), while sparing and preserving water inside your muscle cells. 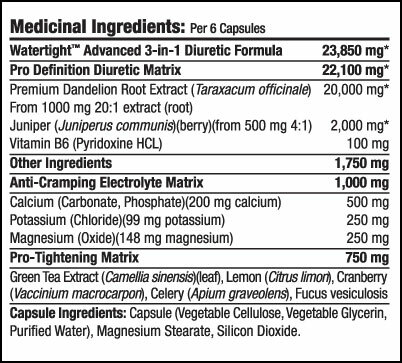 The 9 key medicinal ingredients found in the WaterTight formula were selectively chosen not just for their individual ability to purge water, but also because of their synergistic effects. By influencing greater potassium retention intramuscularly, WaterTight enhances sodium-potassium pump activity. In turn, this causes your body to preserve water inside your muscle cells and shed the subcutaneous water that's beneath your skin. WaterTight is 300% stronger than the original leading U.S. brand and delivers 3 times the #1 active ingredient of any other brand on the market! WaterTight is so powerful that it's the preferred choice for natural diuretics amongst top pro bodybuilders, MMA fighters, fitness models and figure cover models! Who can benefit from WaterTight? WaterTight is the perfect solution for anyone looking to shed excess water weight and enhance muscle definition – fast! Competitive bodybuilders, MMA fighters, figure competitors, and athletes that need to lose excess water beneath the skin use WaterTight to dramatically enhance muscle definition and tighten up. Many people also use WaterTight to help shed excess water and decrease bloating before a photo shoot, wedding, special date or to simply look better on the beach! WaterTight is your secret weapon when you only have days to look your absolute best! How do you use WaterTight? Beginners or first-time users of WaterTight can take 3 capsules, twice a day for up to 15 days. Competitive athletes, bodybuilders, figure competitors and those who are very experienced with using diuretics may choose to use up to 6 capsules, 3 times a day, for 3 to 5 days. Should I increase my water intake while using WaterTight? Yes, for your first 3 days on WaterTight, increase your water consumption from what you would normally drink on a daily basis. During your last 1 to 2 days on WaterTight decrease your water intake. This cycle creates a temporary “super flushing” effect in those last 24 to 48 hours. Yes, WaterTight should be cycled! It's never a good idea to stay on a diuretic for a long period of time or else it'll lose its effectiveness. Therefore, it is best to use WaterTight for a period of 3 to 7 days followed by at least 7 days off.